An easy to make comfort food. Spicy, tangy tomato sauce is full of the flavor of fresh herbs and rich chicken. Serve hot over your favorite pasta for a warming, filling dish. Heat a couple of tablespoons of olive oil in a large high sided frying pan. Add the onions, peppers, and garlic and saute until limp - about 2 minutes. Add the chicken to the pan (and a little more oil if you need it) and brown it quickly. Add the remaining ingredients except the fresh herbs. Cover, and simmer for 30 to 45 minutes, or until the meat is tender and done. Stir it occasionally to keep it from sticking and ensure the sauce doesn't scorch. Spoon sauce over cooked pasta and serve. 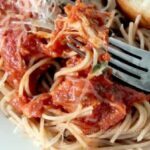 If you are going to make this in a slow cooker just put all of the ingredients except the fresh herbs and pasta in the Crock-pot.